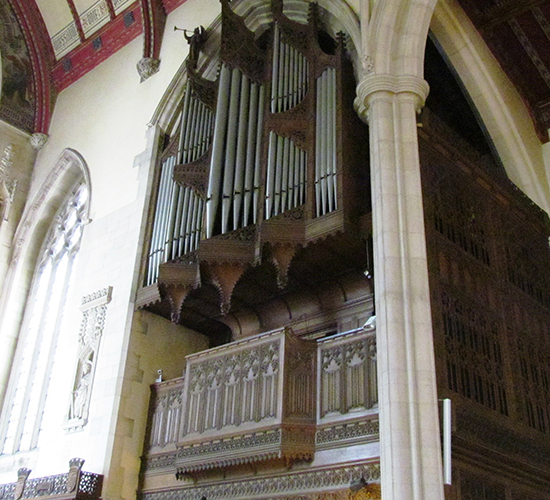 The Brindley & Foster/Rushworth & Draper organ originates from 1897, the year of Queen Victoria’s diamond jubilee, rebuilt and enlarged in 1958. The late-Victorian pipework is extremely beautiful, much enhanced by the ideal lofty position and reflectivity from the limestone/marble of the space. It is a style of organ that sat on the cusp of some great impending changes as the 20th century approached. It has some voices that hark back to early/mid Victorian norms, includes some interesting fertilisation from mid-19th century German ideas, and looks forward to the abandonment of old-style chorus building that was to become so common in the Edwardian decade as highly varied 8ft and 4ft ranks became all that the ear of the period wanted to hear. The excellent casework, from 1911, with a forest of tin display pipes, matches the elegance and grandeur of the tonal scheme.